Pupils from LeSoCo (formerly Lewisham and Southwark College) and Walworth Academy recently visited London South Bank University (LSBU), to get a sense of the foundation that makes up a degree and subsequent career in construction. 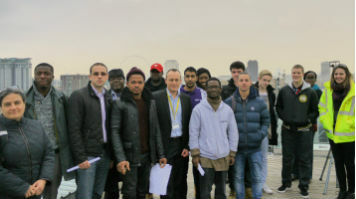 Part of the University's outreach activities - and run in collaboration with international property and infrastructure group Lend Lease - the pupils were taken on a tour of LSBU's Centre for Efficient and Renewable Energy in Buildings (CEREB), which included a visit to the roof area – located at the very top of the University's K2 building. Students had the opportunity to see some of the renewable technologies currently in use, such as solar fibre optics - used to light the seminar room of the Centre itself - and photovoltaic panels which feed into the buildings energy supply. To provide the students with a well-rounded impression of the construction industry from the ground up, the day also included a visit to local Lend Lease construction sites One The Elephant (adjacent to St Mary's Park), Trafalgar Place (on Rodney Road) and the demolition site of the Heygate estate – giving the students rare insight into what is means to manage a real building site. "It is important that young people realise that construction and its related professions are a real career choice - offering them a wide variety of roles that they can undertake each of which has an important role in helping to shape the way in which we live in the future", says Darren James, Senior Admissions Tutor in the Department of the Built Environment at LSBU. "The young people who took part in the day had an invaluable opportunity to see how a University course can help in shaping their future and have had the opportunity to visit a construction site to see first-hand how some of these roles may be used in practice", Darren adds.